Many women will experience a problem with body odor at some point during their life - a problem which can be upsetting and embarrassing. It can be helpful to familiarize yourself with some of the most successful methods for treating this condition, in order to be fully prepared should you ever be forced to contend with it. 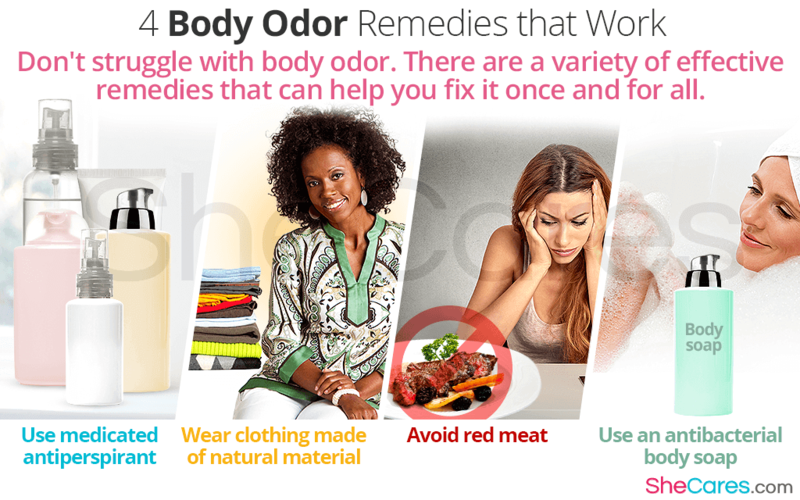 Find out more about some popular body odor remedies used by women all over the world. First of all, it is important to remember that only antiperspirant can properly treat body odor, because deodorant alone will merely mask any smells emitted by your body. Antiperspirant, on the other hand, works to physically stop the presence of sweat, by blocking the sweat glands. The chemical within antiperspirant which is responsible for this action is called aluminum chloride. While this exists in most antiperspirants, it is of a higher concentration in medicated ones. Usually in these, it is of around 15-20%. Another very beneficial remedy for body odor which often goes overlooked, is the option of wearing appropriate clothing. Those who are prone to sweating are advised to choose clothing made with natural fabrics such as cotton, silk, and wool - and for added comfort these should be fairly loose-fitting. By wearing these sorts of clothes, it is more likely that any sweat you do produce will be thoroughly evaporated, and therefore removed from your skin where it will breed bacteria - causing body odor. It is commonly known that diet can effect body odor, but red meat in particular is known to have a significant impact. One scientific study has revealed that those who consumed a diet high in red meat for two weeks, were considered to exude a potent, unpleasant smell in comparison to those who were on a vegetation diet. Cutting this food out of your usual diet is therefore a simple and easy natural remedy for body odor. Body odor occurs as a result of bacteria that exists and thrives in sweat. This then means that thoroughly washing away said bacteria will make a huge difference with regards to the scent given off by your body. In order to ensure this, in addition to frequent showers or baths it is worth considering the use of an antibacterial soap. There are many natural options available such as those made with tea tree, or alternatively a chemical soap containing chloroxylenol is safe and successful for treating body odor. Many women who are affronted with this difficult condition are not aware of just how many home remedies for body odor there are. Instead of becoming upset and frustrated with the problem, there are many options to consider for treating it, before a visit to the doctor is necessary.